Birds eye view of city..
View from SSE showing ESE front of station with numbers 12-4 in background. NS56SE 467.01 NS 58683 64544 36-40 Bridge St. [Formerly entered as NS56SE 467]. NS56SE 467.02 NS 58679 64527 42-52 Bridge St. [Formerly entered as NS56SE 2096]. NS56SE 467.03 NS 58675 64512 54-6 Bridge St. [Formerly entered as NS56SE 2097]. Formerly also entered as NS56SE 1270 at cited location NS 5870 6464 (14-14B Bridge Street, Old Bridge Street Station). Bridge Street Station (1): built 1840-1 for the Glasgow and Paisley Joint Rly, J Collie, architect, and opened 6 April 1841, replacing a temporary wooden structure opened, with the railway, on 14 July 1839. A two storey building with five central bays and twoprojecting end pavillions, each with the remains of an arched entrance. 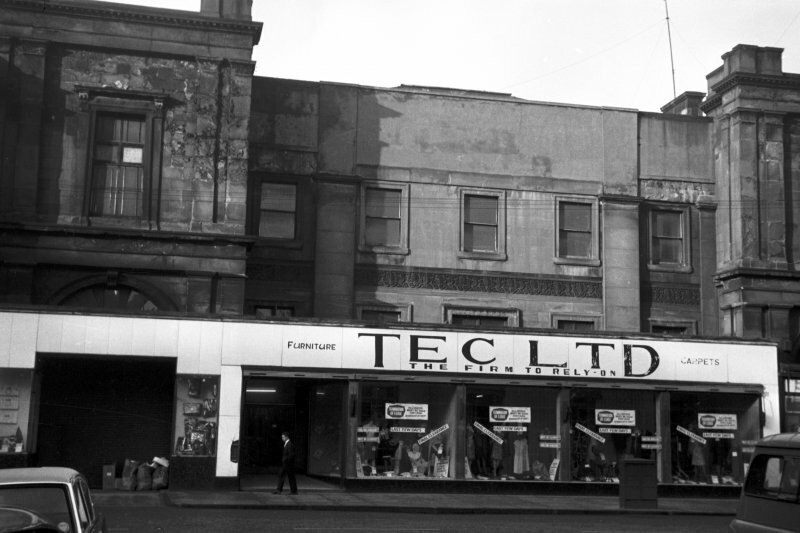 There was originally a central tetrastyle Doric portico, removed c. 1950, and the building was much deeper than at present. 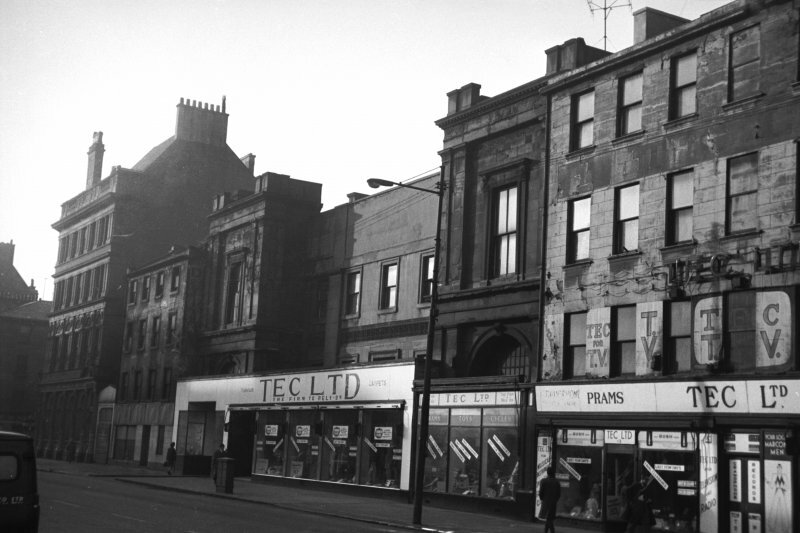 The four storey building to the N was a hotel associated with the station. Bridge Street Station (2), 36-54 Bridge St: built 1890 for the Caledonian Rly, James Miller, architect. A three- and four-storey and attic, 18-bay sandstone block, in early French Renaissance style. SDD category B. Only the main block survives; the station was closed when Central Station (NS56NE 77.00) was extended in 1899-1906. Situated on the S bank of the River Clyde close to Glasgow Bridge (NS56SE 444), this was the first true passenger station in Glasgow. It was a product of the railway optimism of the early 1840's, the façade being an architectural masterpiece. It was described by George Cunningham as 'a place like a church with large columns in front'. 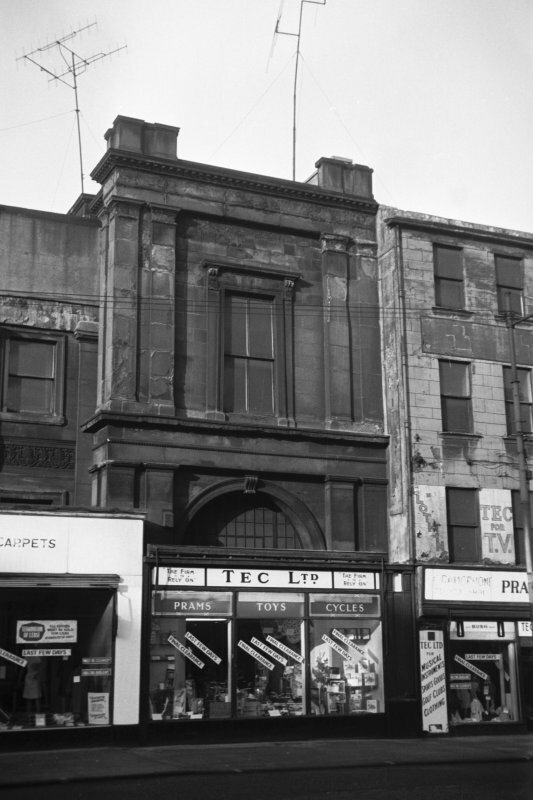 Until February 1892, this was a joint station run by the Glasgow and Paisley Joint Line Committee, which was jointly chaired by the Glasgow, Paisley, Kilmarnock and Ayr (GPK&A) and the Glasgow, Paisley and Greenock (GP&G) Rlys. All three companies were formed in 1837, but by 1850 the GPK&A and the GP&G had been absorbed into the Caledonian Rly and the Glasgow and South Western Rly respectively. The engineers to the Joint line were Luke and Errington, but the station layout was planned by John Miller and the station buildings designed by James Collie. The foundation stone was laid by the latter on 10 September 1840 and the permanent buildings opened on 6 April 1841, by which date the projected cost of £3800 had risen to over £7000, including the cost of a temporary station during construction works. 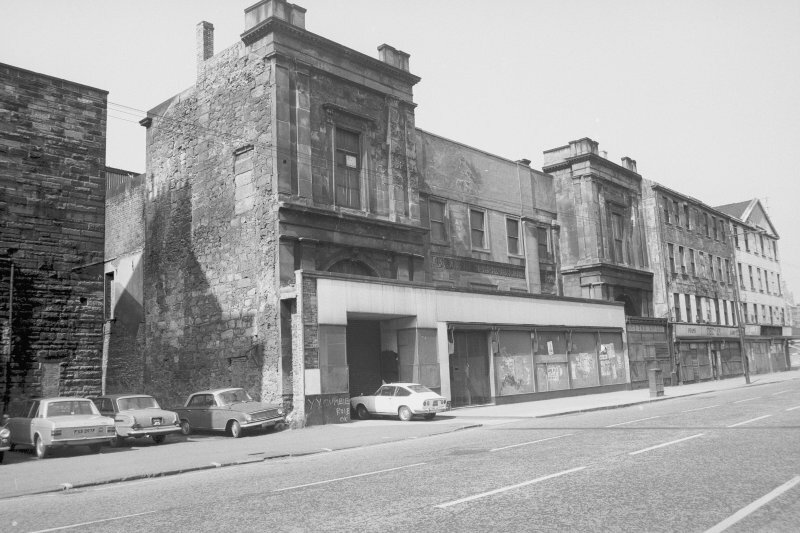 The station was carried over four streets by centre arches of 46ft (14m) span, that over Cook Street being of stone and those over King Street; Nelson Street and Wallace Street of iron. It was carried over 49 brick arches of about 26ft (7.9m) span within a distance of about 550yds (503m); some five million bricks were used in a construction which afforded ample storage space in cellars. Two 'lines of way' (presumably platforms) were provided for departing trains and three for those arriving. The 'station house' was roughly U-shaped on plan, and entered from Bridge St through a superb portico formed by four Doric columns 30ft (9.1m) high surmounted by an entablature and pediment. The associated goods station adjacent to Commerce Street had six lines and fifteen turnplates. A long range of G&SW Rly goods warehouses was linked to street level by two hoists, and there was also a carriage shed adjacent to the S.
The station proved highly successful. 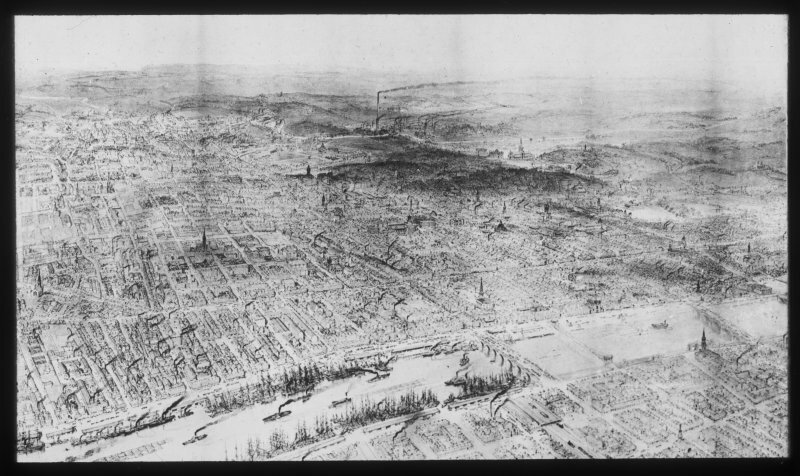 In 1847, it handled over one million passengers despite occupying an area of only 0.75 acre (0.3ha) as against the 3.5 acres (1.42 ha) of Queen St Station (NS56NE 76.00). Detailed improvements during the period of use included asphalting the platforms and the provision of 'self-acting registers' (coin-slots) on the water closets. Between 1857 and 1861, High Maclure improved the station lighting by introducing plate-glass windows and a glass roof at each side of the grand colonnade, while the side-walls of the old booking office were removed and replaced by columns. In 1862, a plan to extend the station and increase the arched accommodation was rejected on grounds of cost. 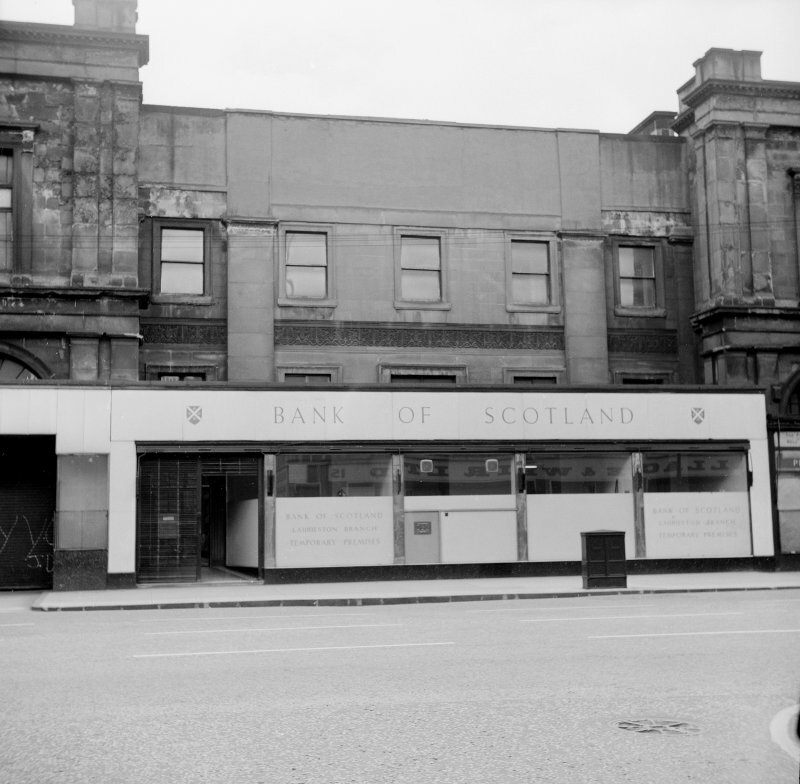 It became increasingly apparent that the increasing suburban traffic (notably from the Wemyss Bay and Bridge of Weir lines) could only be handled by opening the new station (NS56SE 69.00) at St Enoch Square. 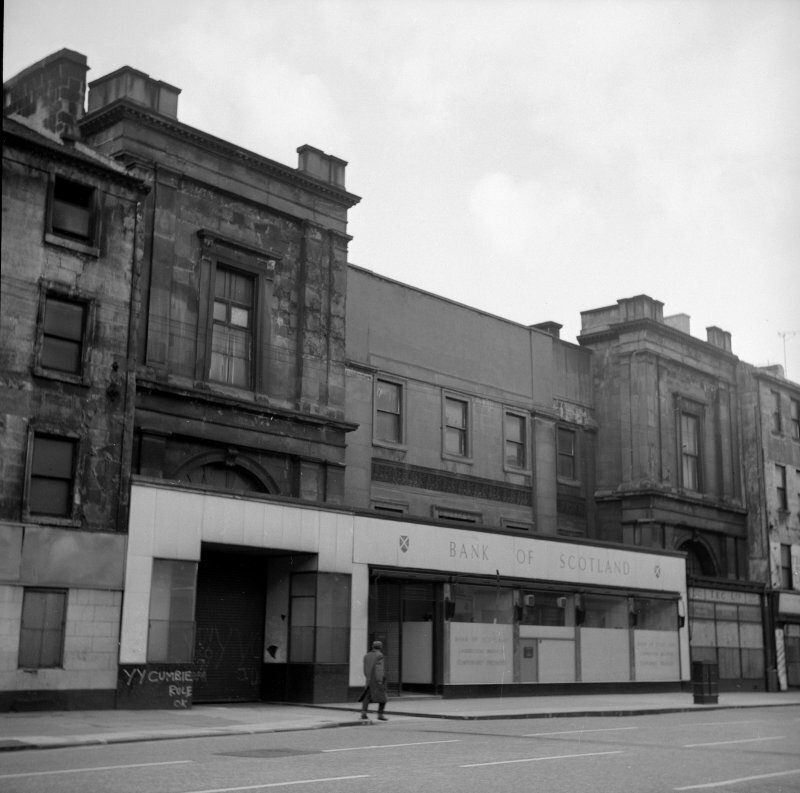 After the opening of the bridges (NS56SE 140.00 and NS56SE 145) leading to Central and St Enoch stations respectively, Bridge St Station was only used by G&SW local services, but the station was, nevertheless, subjected to major improvements, which amounted to a reconstruction. This included the provision of through tracks (on the E side) leading across the river to Central Station, and of a new roof. This latter comprised transverse parallel lattice girders 12ft (3.7m) deep and set 31ft 6ins (9.6m) apart with uncovered spaces to minimise the effect of corrosive engine blast. Being reluctant to experiment with iron arches of large span, Cunningham, Blyth and Westland used this design as the forerunner to the larger version in the first phase at Central Station. In the absence of a detailed prior agreement, the Caledonian Rly was left to pay the bill for this work, resulting in prolonged litigation and, on occasion, to deliberate inconvenience to G&SWR passengers using the station. The legal victory by the Caledonian Rly was essentially pyrrhic, as the works had cost £150,000, only £40,000 less than the cost of the first Central Station. 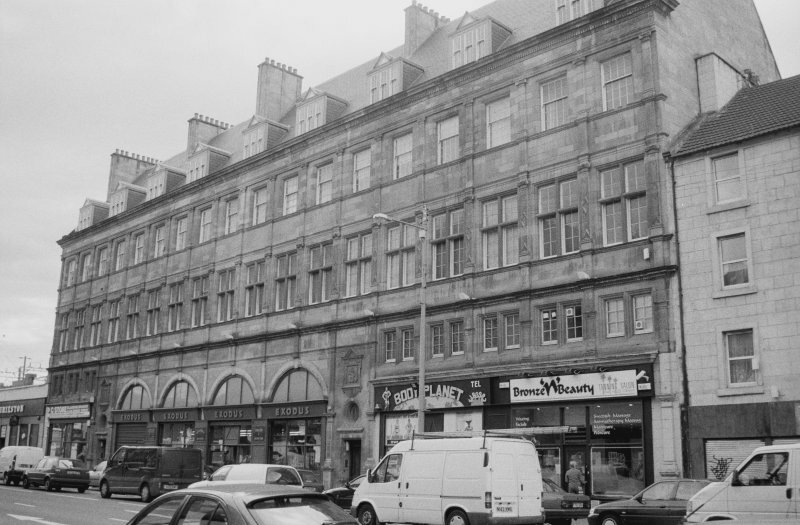 Just before the G&SWR relinquished ownership (in 1892) improvements to Central Station had necessitated a widening of Bridge St and an extension of its façade (to the design of James Miller). The buildings were partially destroyed by fire, but the use of the station ended with the 1904 reconstruction of Central Station. The roof was sold for scrap, and in 1905 it was decided to convert the remaining buildings into shops and houses. 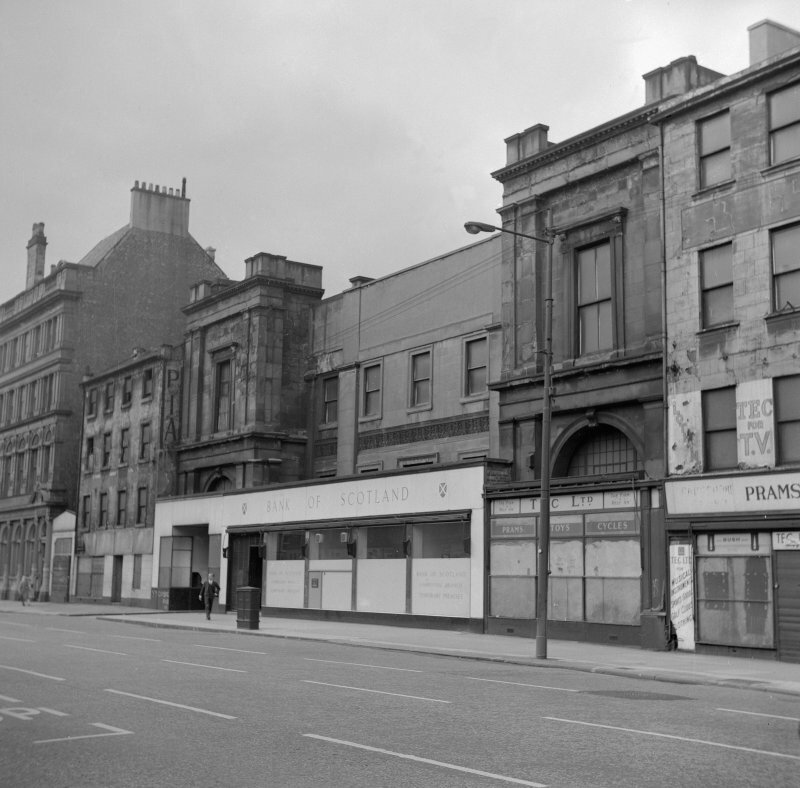 Miller's facade still survives, but that by Collie was badly mutilated in the 1950's and demolished in 1971. (Illustrations include plans of station and 'station house' before reconstruction). This station was opened on 12 August 1840 by the Glasgow, Paisley and Kilmarnock Rly [later the Glasgow and South Western Rly]. It closed to regular passenger traffic on 1 March 1905. 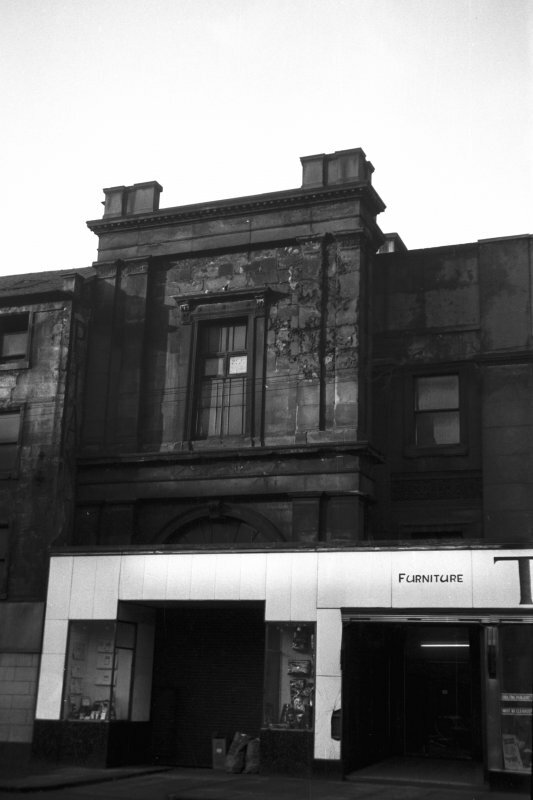 The significance of this station in the railway history of Glasgow is self-evident, both as the first terminus on the South side and as a later cause of controversy and litigation. The main body of the station falls within the area of the approach viaduct leading to Central Station, but portions of the frontage survive facing Bridge Street. The available plans and photographs record a surprisingly prestigious building for its early date and relatively short duration. The location assigned to this record defines the centre of the station platforms as illustrated by the published plan of the station in 1851 (Johnston and Hume 1979, 16, fig. 3). The sub-numbered elements relate to lengths of frontage which had been afforded statutory protection by Listing as individual List entries. Information from RCAHMS (RJCM), 20 December 2005.